It has been over three months since my last post, so my apologies for this and also not giving feedback to your blog posts, although I have still been visiting you all. Family life had to take priority during November and December and then with a new games room being built in the form of a Log Cabin I was not in a position to take pictures for the blog. That has all changed and now I am back up and running. The cabin is well insulated and has a superb heating and aircon unit, so ideal for all year round gaming and I have installed 6 x 5ft daylight tubes directly over the table for maximum light when taking photos and gaming. I have lost the all-round backdrop from my old games room but I have made brackets for 5ft backdrops to slot into the table when taking pictures. I have kept the table the same size 5 x 10ft but I now have more room around the table for socialising. I managed to salvage the old table but I will be making a new mat to go over the top. 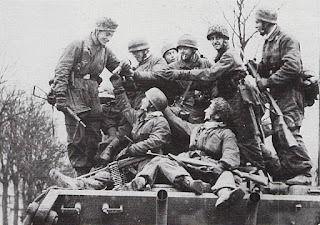 I have not had a game in the cabin yet but I will be having a few friends around the beginning of April for a Battle of the Bulge game and there will be a game report to follow. I have been busy with the hobby as you are about to see and I now have all the material I need ready to finish off my book 'SETTING THE SCENE'. I will start with a couple of extra vignettes that I have done, a simple horse and cart, followed by some Fallschirmjagers on the back of a King Tiger. 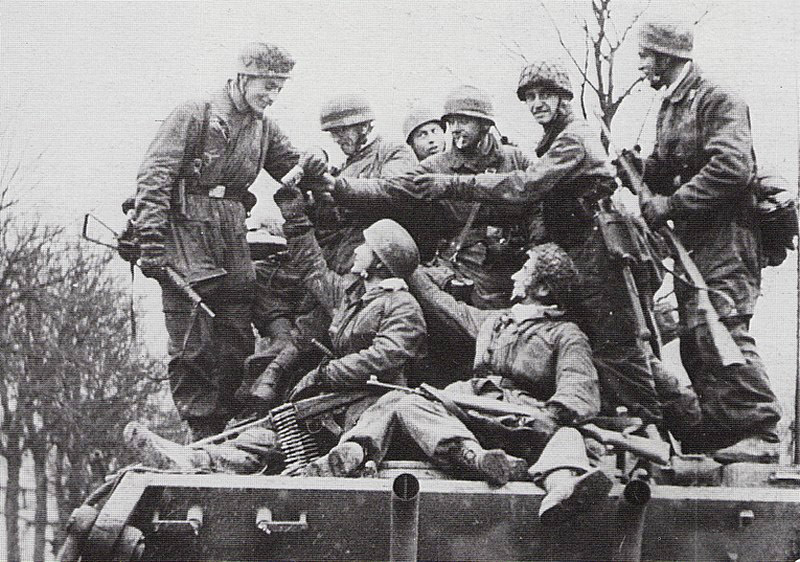 This is quite a famous picture of some Fallschirmjager on the back of a Tiger tank taken at the time of the Ardennes conflict and which I have tried to copy. I have adapted some existing scenery with temporary snow effects, the Chateau converted into Hotel Ardennes, made a load of road and street signs, adapted some more river sections and made a scratch build bridge from a couple of pieces off of a Scalextric set, a winter railway, shell destroyed woods and some large haystacks. The last two items I was inspired from Al and Adrian Deacon's excellent FOY and STAVELOT game table that they did recently and which has been doing the rounds on the forums and shows. The haystacks are a lot bigger than the ones I originally made a couple of years back and watching the FOY episode on Band of Brothers again, I could see how much bigger they were. My original haystack is on the bottom right. I have also finished painting up the American forces and with all the support options, plus the figures for a Rifle or Armoured Rifle Platoon it came in at over 100 x figures. You can see pictures of the figures with the latest batch of terrain as a backdrop. And for something slightly warmer, experimenting with Jungle terrain bases. A Perry Miniatures 28mm figure for scale. You have not been idle! Great stuff! Wow. What a return to blogging. Absolutelly fantastic. Really looking forward to an AAR set on this scene. And congratulations to your new gaming room (house!). Its a dream of any gamer - very clever with the backdrop boards and good to think of installing good lights aswell. Great to have you back. Well worth the wait, an astonishing post Pat and I am more than envious about the cabin. As always your blog is so inspiring...Evocative, atmospheric and wonderful pictures, as always I am really impressed by your skill. Absolutly superb, special mention to the vignette with the frozen horse, terrific! As always thanks for sharing Pat! WOW!...ok I just drooled. My you have been busy Pat! Your own gamers Lair & more fantastic stuff for your book. I am in awe. WoW like everyone else is saying! I'm freezing just looking at it and superb job on the FJ's on the tiger! Really, really looking forward to your book! Good to see you back Pat looking forward to seeing the book. Love the adding of the picture to the back of the table. That is brilliant. I will have to copy that. They look real. I've even turned the heating up. I even feel colder.. great! Truly stunning terrain and minis! Once again Pat lots of detail,lots of photos and amazing work. 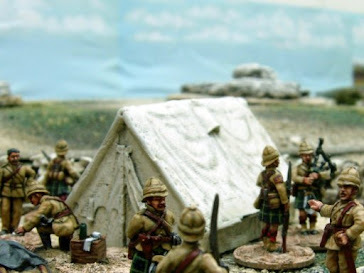 I particularly like the troops on the Tiger and as I am currently making a river for may gaming table, the shoots of your river has inspired me. It was worth the wait - jaw-dropping figures & terrain! You've reminded me that I have those same Scalextric bridge sections in my attic- I may have to go grab them for repurposing... What did you use for the ground litter on those jungle bases? Looks very effective. Cheers. Some of my wife's 'Mixed Herbs' from the supermarket, PVA glued down and when dry, a watery mix of PVA and brown paint over the top to seal it all in and blend it to the rest of the base. Bloody brilliant Pat! Very very impressive. Great looking scenery, looking forward to the book! Love you work Pat !!! I do like your vignettes. Enjoy the new gaming room! Epic! and Awesome! I`m off to turn my heating up. I feel frozen to me old bones! Wonderful Display of Great Looking Fun! And a brilliant job on all the scenery as well as the Fallschirmjäger and their ride! You really don't do anything half hearted, don't you? Fantastic game cabin! I like a lot your winter terrain and models. Looking at the Tiger, I can see these tanks are a bit small for the figures. Phil, I'm in the process of planning a wargaming chalet/mancave for the rear garden, any recommendations re suppliers would be appreciated! Hi Dougie, I went with the link below and we had done quite a bit of research as there is a lot of companies out there that are cheaper but the quality did it for us. Okay fantastic painted minatures, terrain and an entire man-cabin. Now where does that rate on the jealousy scale. Oh that'd be the top then !! Thanks Phil, it was a long time coming. Pat, I cannot wait to check out your book when it's released. I'm always awestruck seeing your beautiful photos of your hard work. How long do you think it'll be before it's available? As it happens today is my last working day in my job and then I retire, so I will now have lots of time for the hobby after today. I have all the material for the book and I am 95% of the way through putting it together in its right context, then it will be getting the graphic design and proof reading done. After that I will either be approaching Richard Clarke from 'Too Fat Lardies' or Warlord Games to see if either of them would be interested in taking on the book or I may finance the printing and advertising costs and take it on myself. So the answer to your question, my side of things should be finished very soon in the next couple of weeks and then I will be going into unknown waters but hopefully the graphic design and printing wont be a long process. I'm a little familiar with the process to get books published and I know it's not a quick endeavour at all. This is obviously a labour of love and I wish you the best of luck to get your finished product as close to what you envisaged. I'll be eagerly looking forward to further updates! Wow these images are phenomenal!